According to the National Institutes of Health (NIH), electronic cigarettes are being used by American teens at an alarming rate. In 2018, 37.3 percent of 12th graders reported using vape products, compared to 27.8 percent in 2017. The annual poll is pulled each year from a nationally representative sample of eighth, 10th, and 12th graders in US schools. Electronic cigarettes are devices that operate by heating a liquid solution so that it produces an aerosol that is inhaled. The solutions typically include nicotine, flavoring, and a humectant, such as propylene glycol. Some specific products, such as JUULs, use nicotine salts in e-liquids that increase the rate and amount of nicotine delivered into the blood. While e-cigarette use is generally considered “vaping,” the device doesn’t actually produce a vapor. These devices produce an aerosol which can contain tiny chemical particles from both the liquid solution and the device. What Can Businesses and Schools Do to Reduce Use? If you wish to remove e-cigarettes from your facility, while simultaneously complying with state or municipality indoor smoking regulations, the easiest solution is hanging No Smoking Signs. 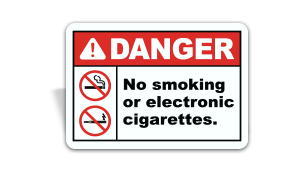 SafetySign.com has specifically manufactured No Smoking or Electronic Cigarette Signs for businesses and schools to use throughout their building and grounds. They’re the quickest and easiest solution to notify personnel, students, and customers that, along with traditional cigarettes, e-cigarette use is not permitted. The growing trend of vape use is disconcerting, but there are options for businesses and schools to reduce it. Start doing so by positing signs.